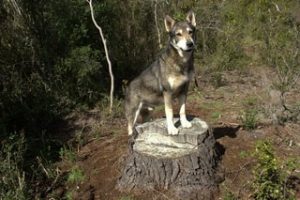 Welcome to SportyDogGuide’s KLIMB Dog Training Platform Stand Review! Dog training platform stands are great for obedience training. Because many dogs like to have their own perch – a place to “lord” over that they can call their own. An obedience platform makes it clear where your dog stands (or sits) while training. Your dog has a special place of its own, while you can control the situation. Aren’t training platforms just for agility training? Though generally associated with agility work, dog training platforms can be used in a number of ways. 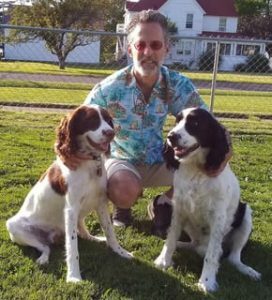 From agility to multipurpose obedience training to a place of reward. You can use the platform to establish clear boundaries between your dog and any number of things, such as areas of the house and visiting guests. And here we’re going to look at a training platform that helps you and your dog do it all. The KLIMB Dog Training Platform and Agility System, from Blue-9 Pet Products is super versatile. You can use it as a single platform or in modular fashion, with two or more KLIMBs attached side by side or vertically. 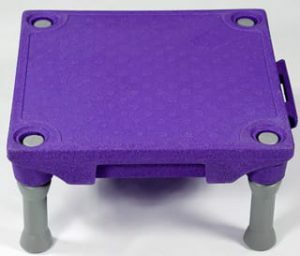 Each platform is a square piece of solid molded plastic measuring 24 inches by 24 inches. The surface features a rubberized coating to provide better footing and comfort for your dog. Four detachable legs screw into posts for elevated use – fully assembled the KLIMB stands 12 inches high. Unscrew the legs, and they fit in a recess on the underside for easy storage. Lock the two tabs on the side into tab openings with other KLIMBs to create larger systems. 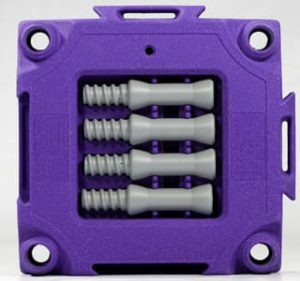 The KLIMB is available in three colors: black, blue and purple. Getting started with the KLIMB is a cinch. Screw the legs in place and set it on a flat surface. Many dogs will quickly jump or step onto the KLIMB. If there’s resistance, you can lead them on and off with a toy, food or treat followed by lots of praise. You can also put food directly on the platform to create a positive association. A leash can also be helpful to provide gentle guidance, but don’t ever drag your dog onto the platform. If your dog still is hesitant, remove the legs and have your dog walk back and forth across the platform – again using treats or some other form of reward. Once he or she has gained confidence, you can reattach the legs to create a normal climb. Once your dog is comfortable being on the platform, you can use food to teach him or her to sit and stay. As mentioned earlier, the KLIMB is an excellent tool for agility training. One of the most popular uses is as a “pause” table, creating a stopping and/or turning-around point in an agility course. See some of the platform’s many possible uses for agility training in this video. The KLIMB also makes a great “step” to help your dog into your car. Some dogs will leap right in, but if your dog is reluctant you can use the platform as a guide. As a step-down, the KLIMB can eliminate the wear and tear of jumping out of the car straight onto the hard ground. It can also be used by your dog like a shallow stair to step onto a bed. Easy to use – I love how easy it is to assemble and take apart. Just screw in the legs and you’re ready to go. Easy to store – When not in use, tuck the legs into the recess in the back where they are held in place. It’s a tidy package for storage. Portable – You can easily bring the KLIMB with you for training near and far. Configurable, configurable, configurable – The QuiKonnect system makes it easy to connect multiple platforms for a custom configuration. You can also link them together horizontally to create a larger single surface. Furthermore, you can stack two or more KLIMBS vertically in a tower formation or stagger them to create pyramids. These are all great options if you have a large dog or two – or more – smaller dogs. Quick cleaning – The KLIMB is completely waterproof and dries quickly. After a training session, you can clean the platform with a wet rag or hose it down if it’s really dirty. The KLIMB is a super-versatile training tool that’s great for agility and general obedience. 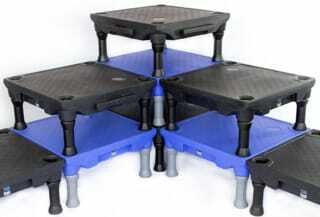 Other customers love it, saying the platform is sturdy, durable, easy to assemble and carry. And it’s just plain fun to use. Platform training is a great way to build your dog’s confidence and coordination. You’ll have fun, your dog will have fun and you’ll get a better-behaved dog in the process.